From computer hackers learning Kung Fu in The Matrix to two detectives using a single computer keyboard in NCIS, computer hacking in movies has never exactly been realistic. There are a couple of potential reasons for this. A decade ago it could conceivably have been the case that screenwriters simply didn't know how computers work, but in an age where most people spend entire days using technology for work, it's unlikely that this is the case any longer. Personally I've always assumed that on-screen hacking has continued to be unrealistic because of how dull it so often is in the real world. Hacking in the real world isn't something that happens in a frantic mess of keyboard mashing and people yelling "I'm hacking into the mainframe!". It's a slow process, one which involves painstakingly tweaking bits of code to allow them to circumvent a computer system's defences. It's surprising, then, that Mr. Robot, with its focus on making the process of hacking as realistic as possible, has not just won the hearts of computer enthusiasts, but also the non-tech savvy. Perhaps more surprising still is that the show has managed to do this while making hacking such a central part of its premise. The show follows protagonist Elliot Alderson as he works as part of the hacking group fsociety to take down the evil corporation named E Corp.
We sat down with Kor Adana, who worked as a hacking supervisor on the show, to talk about how to make realistic hacking interesting, as well as the morality of real world hacking. The hacking scenes in Mr Robot are famously realistic. Did it feel like a risk to you in any way prioritising this realism over the kind of over the top drama that might work better on camera? Well I think Sam [Esmail, the show's main director and executive producer] would agree with me when I say that we do feel that there is drama, there is inherent drama, in the realism. We think we'd do a disservice to our world and our story if we exaggerate and use extreme graphics and [use the stereotype of] the nerd in the corner who can type furiously with a keyboard... and he's used for exposition just to get some information out to the viewer. I think we can achieve both, and to Sam's credit I think Season One is a great example of how portraying the realism really adds to the story, adds to the character and adds to the themes of the episode. When Elliot goes into his character's perspective, he's using metaphors to describe his emotional stage that relate to the technology in a very realistic and authentic way. Even if you don't understand the technology you can root for him and understand what he's saying and feel for him, and yet at the same time but if you do understand the technology you can understand he's talking about... viewing the source on a website but he's also talking about introspection and self-reflection and trying to be his true self and his own source. We're working on different levels here and I think that's why the show works, because it appeals to people on different levels from a technology and from a drama perspective. We see hacking in Mr Robot, but where do you stand on real-world hacking? Is it a force for good? I think it all comes down to motivation. Of course if we're talking about the culture of hackers you have your black-hat hackers, who are out for personal gain or they have some form of malicious intent, and you have your white-hat hackers, who are working within the industry or are hired by businesses to find flaws and security holes so they can be patched. You also have hackers that fall in-between in the gray area who may not have permission to attack but they don't act maliciously, they'll find a hole and then publish it publicly. They'll cause a little bit of embarrassment but they won't sabotage... and I'd compare those to members in our society. There are those that will hack for political gain and they want to elicit some kind of societal change, or there's some injustice in the world that they need to right. So it really depends on the motivation that's there. Each form of hacking has evolved into these different silos, and it's difficult to talk about hacking it all depends on the group you're discussing and what their motivations are. Like any skill or superpower it can be used for good or it can be used for bad. You've spoken previously about a hacker that hacked the Mr Robot website, and in that instance it was someone who provided you with details and allowed you to patch it. Yeah it's something that could have potentially been very very bad, but ultimately it was a very detailed account of what we could do [to fix the security hole]. We were in communication with him long before the public was aware of it, so that's an example of a grey-to-white, which fell in the spectrum of no malicious intent but still we weren't in control, it wasn't like we reached out to him to hack us. The hacking community from all across the spectrum, white hats, grey hats, black hats, responded to the show in such a positive manner and that's been really surprising and validating and it's one of my goals to meet the expectations of that kind of demographic. They're very smart, they're very detail-oriented and they appreciate the little details and the work that goes into building out the hacking scenes in the show. So going back to talking about intent in hacking communities, you kind of talked about hackers using hacking for good and to take down evils organisations. Is there a worry that people acting in this way is a form of vigilante justice? Definitely, there is this worry of taking the law into your own hands and this is something that's common among [hackers]. I think for myself when I dabbled in hacking as a teenager I had this defiance, this angry defiance which is applicable to a lot of the hacking community especially when we're getting into. If you feel that something is not right, if you feel that there is some kind of injustice and there is some kind of injustice and you have the power to do something about it, and if you're aware that your power is a rare one, if not everyone is as skilled as you are with regard to computer systems or networking there is an element of taking matters into your own hands. I think the show deals with that directly where if the authorities are not going to be just, or if you feel there is an injustice and you want to take action against what is an evil corporation. You see that early in Season One where Elliot is a vigilante hacker, before he gets involved in fsociety he's just taking down people who he feels [deserve it]. He's the judge and jury and executioner and it's all in his hands, but I think that's something that most people consider when they get into hacking because it is a rare power and it's a rare skill and it's a difficult skill to acquire so there is an element of vigilantism. So do you think people are justified in stepping in if they feel there are injustices which they feel aren't being dealt with by the authorities? I think that there have been instances of hacktivism that I can completely get behind. I think that you see elements of that, examples of that in the Arab Spring to do with internet censorship and access to communications and access to information and there are causes that I can get behind where I believe that going outside of the realm of law and order is justified. There are hackers out there that do an enormous amount of good outside of the law. There's a hacker called the Jester who he has an anonymous presence online, [and no one] knows what his real identity is. He gets a lot of information on terrorists websites and terrorist social media accounts and he takes down jihadist social media sites and he's doing a lot of good but he is a vigilante, he's an online hacker vigilante. It's a complicated situation and you need to asses the injustice and your own moral compass and where you stand with your own ideology and make your decision from there and sometimes you need to out-monster the monster. In terms of combating the darker side of hacking, either by individuals or the state, what do you think is the best defence? Should the onus be on individuals or the state? I think there could be an element of both to be honest. I think that individual people should take steps to protect themselves as much as possible if they're educated enough and that they should work to protect themselves by using two-factor authentication and strong passwords that are different for each account. The thing you have to consider is that a piece of malicious software, a cyber-attack, is that a weapon? Is that a terrorist weapon? There are steps that as we get more into this day and age where we are relying on the software and the technology I think that the government does need to take steps and secure it as much as possible. But there's another issue at play here, I think that there is a generational gap sometimes, because there are a lot of adults, just by the nature of the generation I was in [since] I grow up as the technology evolved. I think there's a limited understanding among an older generation of how this works in what ways we're vulnerable and more and more, as time goes on I think other people get into these roles where they can actually make a difference I think you'll see that change. 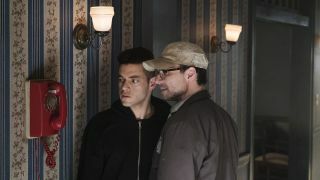 Mr Robot's second season will be broadcast in the US on July 13, and will be available in the UK exclusively through Amazon Prime Video the next day. Check out our list of the best Amazon Prime Instant TV shows.